There are a ton of online travel agencies (OTAs) out there. Orbitz, Priceline, Amex Travel, Costco Travel, and plenty more give you a ton of options to book flights, hotels, cruises, or vacation packages — the latter being one of the best ways to use an OTA to save money. 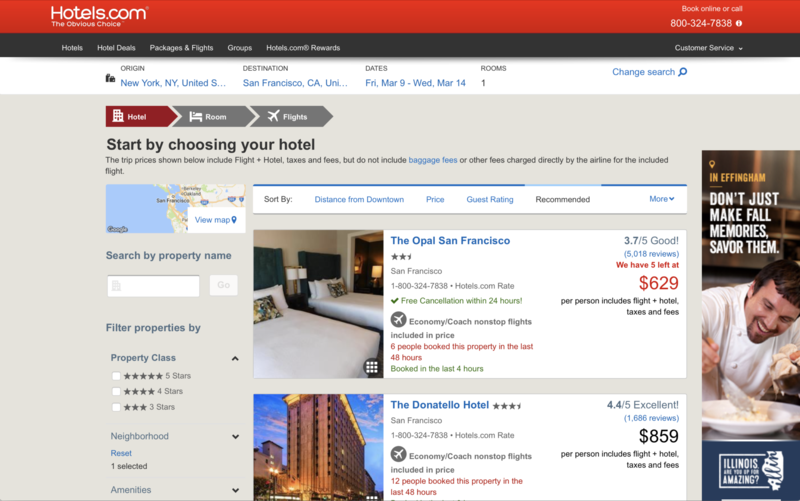 Hotels.com is one of the simpler and more straightforward OTAs available. The website offers an extensive selection of hotels, with a search function and customization filters that can arguably be compared to Google’s Flight search tool. Additionally, Hotels.com offers discounted “secret prices” to members, plus an in-house loyalty program that goes a long way to making up for the fact that you can’t collect a hotel’s points or elite credits for nights booked through an OTA. Let’s take a look at how to best use this platform, and how to get the most value from its offerings. 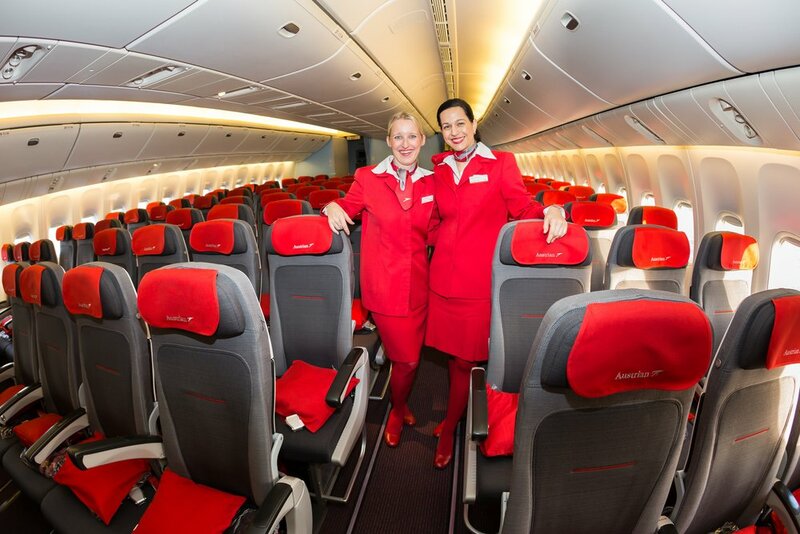 There are a few reasons to book through an online travel agency like Hotels.com. The first is customer service, although this can be a double-edged sword. On the one hand, in the event of an issue like an overbooked hotel, a maintenance emergency affecting your room, or something else, booking through this site means you can contact its customer support and have them advocate for you to try and find a solution. That can be easier than trying to deal with the busy hotel on your own. On the other hand, it means that there’s a middleman between you and the travel provider. This can actually make it harder for the hotel to re-accommodate you, and it could even mean that there’s an extra step to go through when trying to work out a fix. The second reason (which I feel is more compelling), is to try and get a lower price on a hotel by itself, or by booking a vacation package to save on both the hotel and flight. Often, the price OTAs offer for hotels is the same as what you can get from booking directly with the hotel. In many cases, however, an OTA like Hotels.com might manage to snag an extra discount for its customers. Another reason to consider this site: its simplified rewards program. 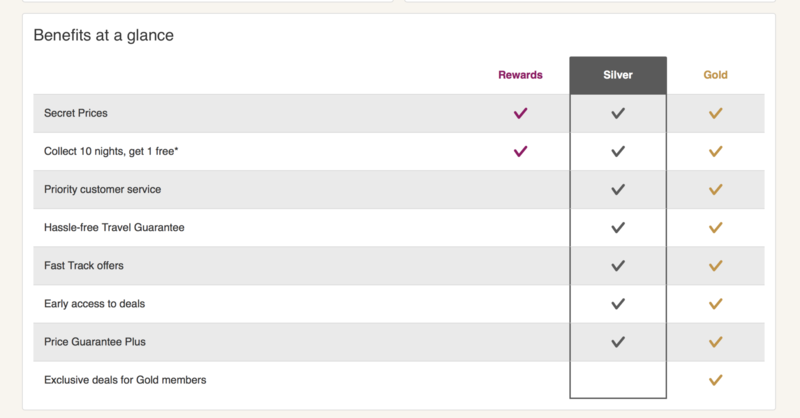 Their Rewards program is admirably uncomplicated. Especially when you look at programs like Hilton Honors and Marriott Bonvoy that have complicated earning and redemption schemes, Hotels.com Rewards is downright simple. Stay 10 nights in any hotel booked through the website, and you’ll earn 1 free night. There are no blackout dates or properties, meaning you can use your free night anytime and anywhere. The value of the free night is the average of the 10 nights you collect. That means that if you stay 5 nights in a $200 hotel and 5 nights in a $400 hotel, you can use your free night in a hotel costing up to $300. That’s virtually up to 10% back on every booking. Hot Tip: Purchase made on the website count as a travel purchase, so make sure to use a card like the Chase Sapphire Preferred® Card to earn 2x points per $1 spent! If you use the free night for a hotel room that costs more than the maximum value, you can just pay the difference. Still, that means you’ll at least get a discount toward that night. You’re also responsible for paying any taxes and fees. If you’re staying 10 nights or more each year with a single hotel brand, chances are you’ll get more value from booking directly with the hotel and collecting loyalty points and elite status perks. Additionally, you might be able to find a discount through organizations like AAA, or there might be promotions that help you get extra points. 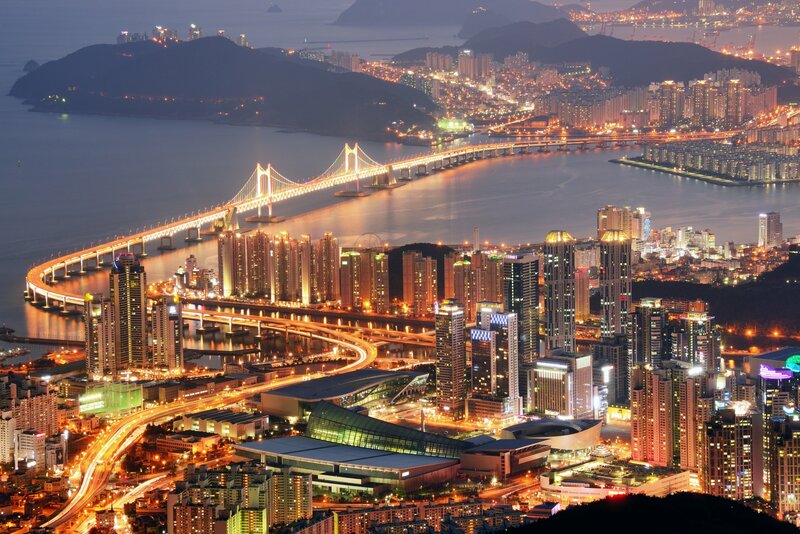 For instance, Marriott Bonvoy often offers double or even triple points-earning promotions. However, if your top priority is to save as much as possible on a hotel each time rather than collect rewards, then Hotels.com makes it easy to get a good price…and a 10% reward while you’re at it. Like Orbitz Insider Prices, Hotels.com offers “secret prices” to its rewards members. While these are usually modest discounts, they can theoretically be up to 50% off the otherwise advertised rate offered on other sites. In sample searches, I usually found 5%-10% discounts with secret prices. For frequent users, Hotels.com actually offers its own version of elite status. Perks aren’t as generous as what you can get with a hotel’s in-house program, or even Orbitz Rewards. For example, there’s no tier that includes room upgrades. That said, there are still some helpful benefits. There are 2 tiers of elite membership: silver and gold. To qualify for silver status, stay 10 nights within 1 calendar year; for gold, stay 30 nights. Both tiers include priority customer service, early access to some deals, and some more involved price guarantees than regular members can get. Gold members get exclusive access to a few extra deals. To search for a hotel, first head to their homepage. There’s a search window in the upper-left corner. Select your destination, check-in and check-out dates, number of guests, and number of rooms. In our default sort of “Our favorites”, the sort order reflects the relevance of properties to your search criteria, as we want to make sure you are able to quickly and easily find the offer that is right for you. We measure relevance by taking into account factors like a property’s location, its review scores, the popularity of the property (measured by how many travelers on our sites make bookings at that property), the quality of the content provided by the property, and the competitiveness of the property’s rates and availability, all relative to other properties meeting your chosen search criteria. The compensation which a property pays us for bookings made through our sites is also a factor for the relative ranking of properties with similar offers, based on the relevance factors described above. 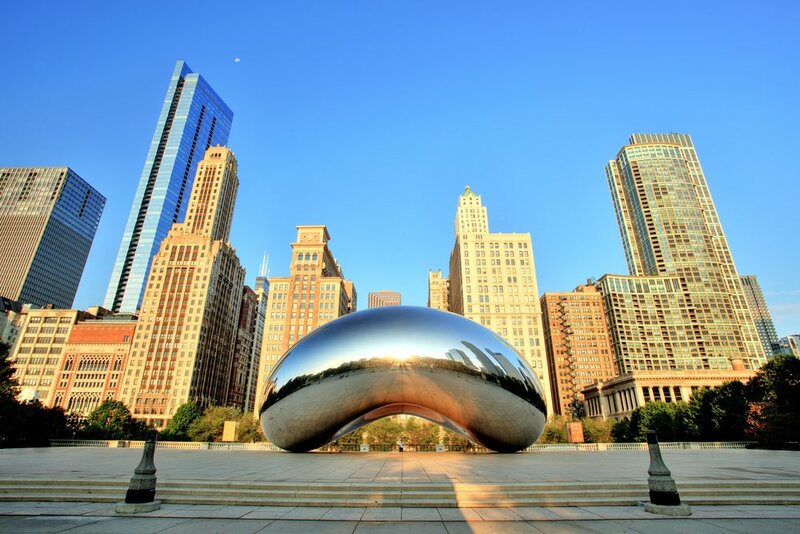 In general, unless I have a specific hotel property, price, or neighborhood in mind, I find that the “recommended” results list on most OTAs is fairly reasonable, and makes it easier to sort through what can be dozens or even hundreds of options in a big city. If you want to reorder the results, use the tools above the list of hotels. You can sort by price or star rating in ascending or descending order, or you can sort by distance to a particular landmark, neighborhood, or station. You can also list results by guest rating. I like the way that they present the “distance” sorting, offering a large list of famous landmarks as well as simply “city center.” If you don’t really know where to stay and are unfamiliar with the city, that gives you some great location options. In addition to reordering results, you can filter using the options on the left side of the page. Filters include neighborhood, specific hotel property, star and guest ratings, nightly price range, accommodation type, amenities, “themes,” and accessibility features. For some reason you can also filter results that allow you to collect nights toward your Hotels.com reward — I’m not quite sure why, because most (if not all) hotels allow this. During all of the sample searches I’ve made, I couldn’t find any hotels that didn’t qualify. Hot Tip: Unless I have strong preferences about where to stay, I tend to sort by distance to city center. When browsing through the results, pay attention to any terms under the listed price — if free cancellation or pay-at-check-in is available at that hotel, it lists that here. Also be sure to log in to your Hotels.com account or enter your e-mail address so that you’ll see “secret prices.” Hotels with that option will show a purple button above the listed price that reads “Your Secret Price.” Click the button to see what’s offered. Look out for the purple “secret price” icon, and make sure to check below the price to see if the hotel has free cancellation. When I compared secret prices to prices offered to non-members, I typically found discounts of 5%-10% per night. Most of those hotels offered discounts to non-members, but those were smaller discounts than the secret prices. As you browse the results, click the “Choose Room” button to see more information about the hotel or make a reservation. The next page offers a lot of details about the hotel listed under the photo slideshow. Scroll down to view available room types. Make absolutely sure to read the information in the “options” column — this includes the cancellation and prepayment policies. Click “Let’s Book” next to the room and rate you choose. Keep an eye on the “options” column for rate details and rules! Like many OTAs, they will offer a best price guarantee. If you find a cheaper publically-available rate on another site after you’ve made your reservation, Hotels.com will refund the difference. While many sites like Priceline require you to submit a price-match request within 24 hours of making the booking, Hotels.com will honor requests made until 11:59 pm the day before check-in. Hot Tip: To submit a claim if you find the same room for a better price, call customer service at 800-246-8357. Keep in mind that the price match only applies to rates that are available to the general public. This excludes loyalty members-only rates, AAA or AARP rates, and opaque booking rates (like what you could find from Priceline Express Deals). While there is a best price guarantee, it’s much easier to just pay the best rate from the beginning. So how do Hotels.com’s rates compare to other sites? To find out, I looked at a few different hotels and dates across several different services. 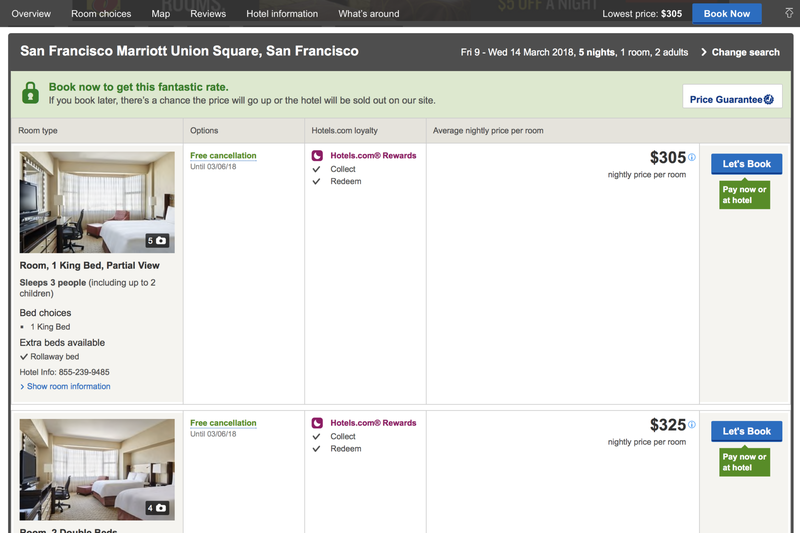 For the sake of example, take a look at the below comparison for 5 nights at the San Francisco Marriott Union Square in March 2018. In this case, Priceline offered the best rate by a significant amount. In fact, Hotels.com was more expensive than every other site (though only by a few cents in most cases). This seems to be an exception, though — I suspect Priceline was offering a special rate or deal. I tried searching a few other properties, and Hotels.com usually had a similar or identical price to other sites — in some cases, it had the lowest rate. Hot Tip: Always compare prices between a few different sites to find the lowest rate! The lesson here is that each OTA offers different rates at different hotels based on deals, agreements, and more. If you have a specific property or area in mind, the best practice is to compare prices using a few different sites. 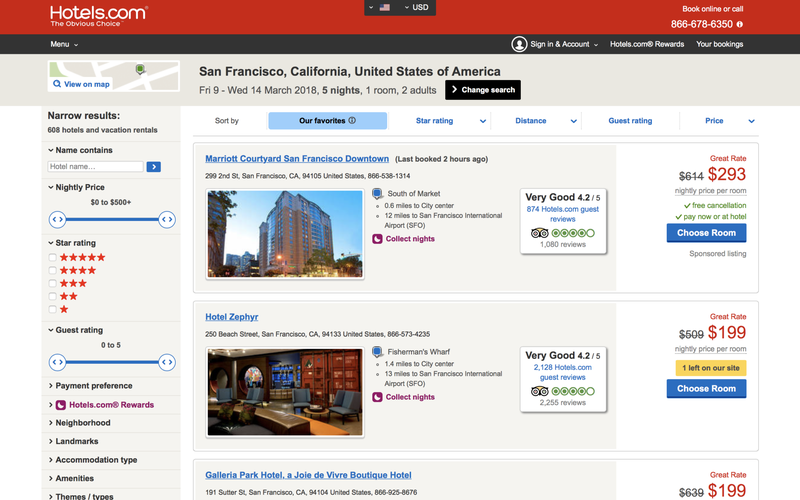 Bottom Line: Hotels.com makes it easy to search for hotels. Once you find a property you like, make sure to compare prices between sites. Hotels.com’s promotional tagline is “the obvious choice.” Another thing that’s obvious is that they’re all about booking hotels. Unlike other OTAs, such as Priceline and Orbitz, the website doesn’t offer rental cars, cruises, and so on. However, despite its name, they do offer flights and vacation packages — with a package, you can save some money by booking a flight and a hotel together. The hotel packages are less comprehensive than what Costco Travel offers, but they’re still valuable. You can even find a limited number of activities in certain cities. One caveat: Package, flight, and activity bookings are not eligible for Hotels.com Rewards credits, even if you include a hotel. Because of that, there doesn’t seem to be any advantage to booking through their site instead of a site like Orbitz, which does reward these bookings. Hot Tip: Even when you book a flight through their portal, you can still earn the airline’s frequent flyer miles. Just be sure to enter your account number when making the reservation. This is especially true if Hotels.com doesn’t offer any major price advantages on flights or packages compared to other OTAs (which was the case in several example searches I tried). Because the site is owned by Expedia, which also owns Orbitz, I suspect that these functions are only available since they were easy to set up using Expedia and Orbitz’s backend functionality. I also suspect this to be the case because the features are hardly promoted on the Hotels.com website — you actually have to go looking for them. Should you decide to use these tools, however, keep reading to learn how to book flights, packages, and activities, as well as how prices compare to other sites. Navigate to their homepage and click the “menu” text in the upper-left corner. Then, click “Packages & Flights.” Click on the “flights” tab. Enter the cities you’re flying from and to, travel dates, and number of passengers. Click “advanced options” to choose whether you want to search for just nonstop or refundable flights, cabin class, and any airline preferences. Click “search” when you’re ready. The Hotels.com flight search page. As soon as you get to the results page, the website tries to prompt you into booking with various alerts about how many people have booked similar flights, and a warning that prices could go up. Feel free to ignore these. 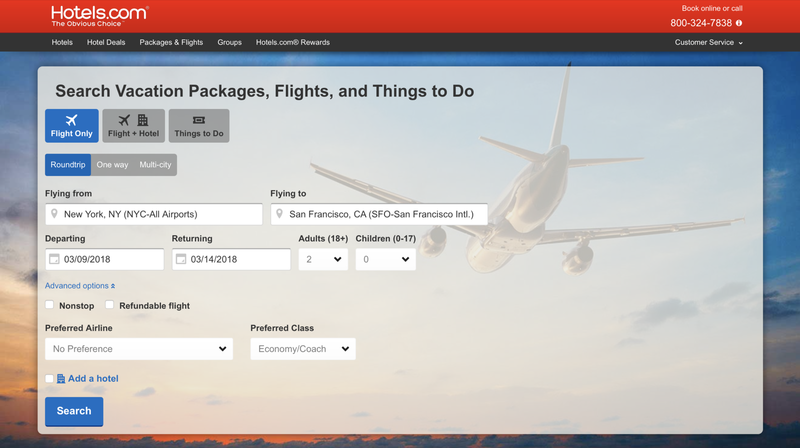 It also suggests that you can save money by booking the flight with a hotel by displaying a package at the top of the results list. If you’ve decided against a hotel package, you can feel free to ignore this, too. Ignore those gentle “hints” from the site! By default, results are shown by price. Options on the left sidebar can filter the results by airline, departure time, or airport (if your trip involves a city with more than one). You can also click “show flight details” to see more about any flight, including the plane type and baggage fees. Hot Tip: If you book a flight through Amex Travel instead, you’ll earn 5x Membership Rewards points if you use The Platinum Card® from American Express, or 3x points for using the American Express® Gold Card. Review your flight details on the next page. Once you’re ready, scroll past yet another prompt for hotel packages, then click “book now.” Enter your personal details, fill in payment information, click “complete booking,” and you’re all set! Across a few sample searches, prices were identical between Hotels.com and other sites, including direct booking with the airline. 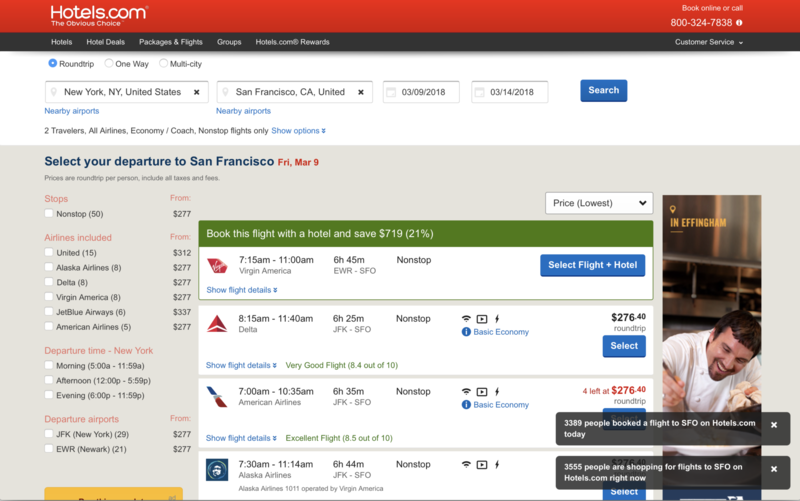 Bottom Line: Hotels.com has a fine flight booking tool, but it almost feels like an afterthought. With no rewards program, you’re better off using another site. To search for vacation packages, click the “menu” text in the upper-left corner of the homepage, then click on the link for packages and flights. Make sure to click the “Flight + Hotel” button. 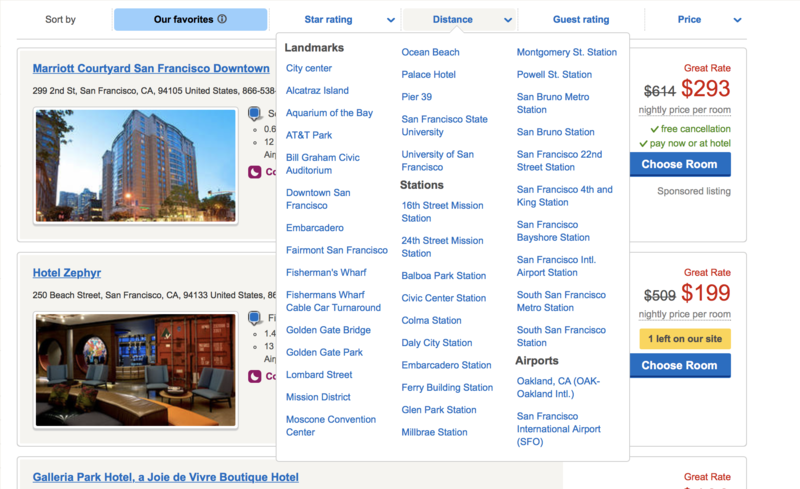 The results page starts with hotels, listing them in “recommended” order. You can also sort by price, guest rating, or distance from downtown. Additionally, you can use tools on the left side to filter results by property name, star rating, neighborhood, amenities, property type, or popular locations. Each result displays a price per person, which represents the cheapest available flight, the hotel’s lowest rate, and all fees and taxes. Remember that the price displayed is per person. Click a result to see more details of the hotel. When you find one that you want to book, scroll down to find the available rooms. 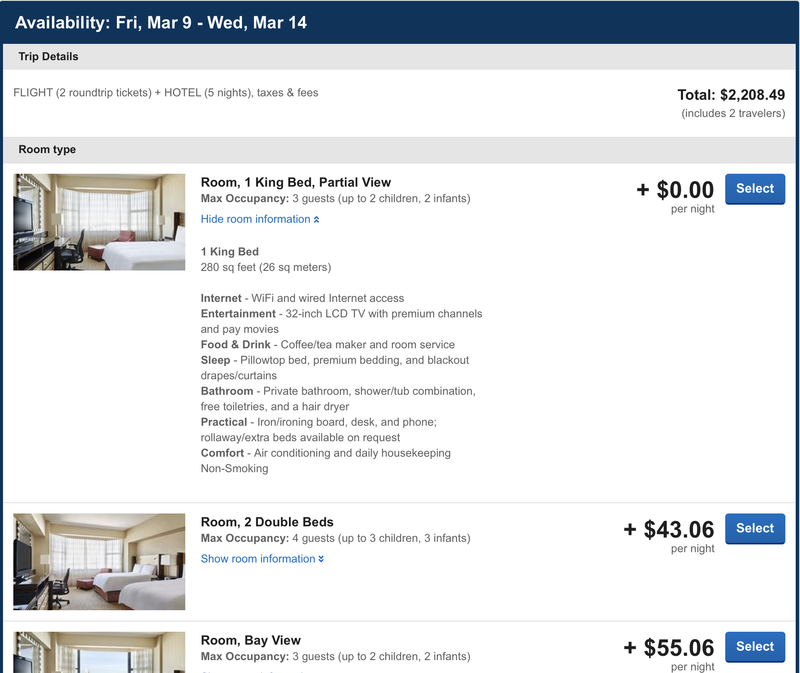 Some rooms may show an additional price per night on top of the rate shown on the results page, though there will be at least one “+ $0.00” option. The price shown on the results page includes the lowest-cost room. If you choose an upgraded room, the price will likely increase. Next, pick your outbound flight, followed by the return. These are sorted by additional price — the top results are included in the quoted price, while any flights that have an additional cost will be lower down. When possible, they’ll prioritize nonstops. Review the details on the next page, then click “book now.” Enter your details on the next page, followed by payment, and you’re all set! In several sample searches, I found that there was usually a discount of 5%-10% compared to booking the flight and hotel separately. For example, I searched for a 5-night package in San Francisco leaving from New York using the same flight and hotel examples above. The total for 2 people if I booked separately was $2,330 including all taxes and fees. The total for the same exact flights and hotels as a package was $2,205. That’s a savings of just over 5%. I should note that I found the same hotel and flights as a package on Priceline for only $2,042, but this was an inferior room compared to the cheapest available through Hotels.com. When I chose the same room, the prices were identical. Bottom Line: Hotels.com offers a solid vacation package portal, though prices are similar to other OTAs and you can’t collect their Rewards credits. 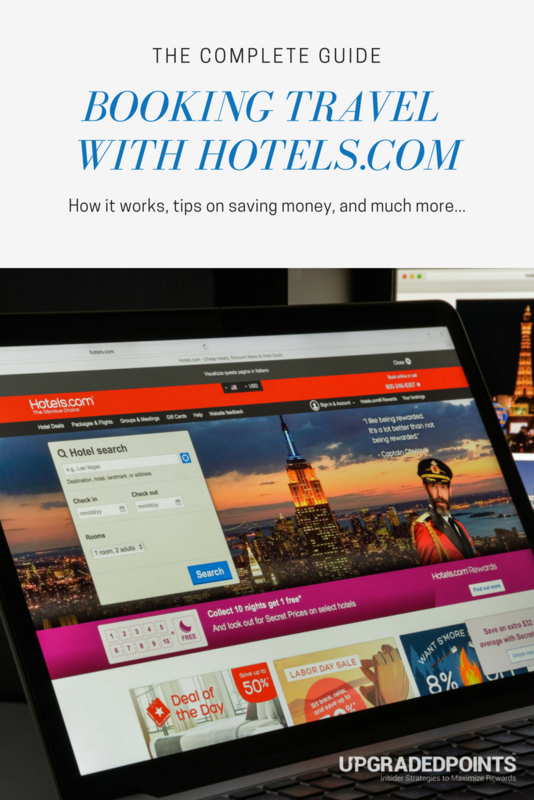 Hotels.com offers a portal through which you can book things like tours or purchase admission tickets. I compared prices across a number of different products, and they seemed to be the same as booking directly with the providers or with any other ticket seller. This service offers a powerful hotel search tool, as well as a simple, easy-to-use rewards program. If you’re looking to travel a few nights a year, it could be worth booking through their portal. If you’re spending at least 10 nights a year in hotels, though, you’re likely better off booking directly with the hotel so that you can earn hotel loyalty points and possibly elite status. As always, remember to compare prices. Because Hotels.com offers a fantastic price guarantee, you’re protected if you find a cheaper rate anywhere else up until the day before check-in. It’s an online travel agency (OTA) — a website you can use to book travel. Although the site is based on searching for and reserving hotels, it also offers flights and vacation packages. Can you cancel Hotels.com reservations? That depends on the hotel. Just like when you book directly, some hotels’ policies allow you to cancel and get a refund, while others are nonrefundable. When booking, make sure to read the terms and conditions! Can I book on Hotels.com for someone else? Absolutely! Just enter the other person’s name and information when making the reservation. What is the Hotels.com secret price? Hotels.com offers a loyalty program through which you can earn rewards for each night you book. It’s free to sign up, so anyone using the site should open an account. The “secret price” is a discount available on some hotels to any rewards member. If you’re logged into your account while searching, you’ll see the discounted price when you search for hotels. What is Hotels.com silver or gold? Hotels.com offers 2 “elite” tiers to Rewards members who purchase 10 or 30 nights a year, respectively. If you qualify, you’ll receive certain perks like priority customer service and early access to deals. What is Hotels.com price match guarantee? The price match guarantee is extremely useful. If you find a cheaper publicly-available rate on another site after you’ve made your reservation, Hotels.com will refund the difference up until the day before check-in. What do you mean by collect nights? “Collecting nights” just means booking hotels through Hotels.com. So, for every 10 nights you collect through Hotels.com (meaning for every 10 hotel nights booked through Hotels.com) you will earn 1 free night.